I had some trouble finding these all together in the archives, so here they are posted together. I have included the most common pins: emissions, ECU, and CC/ETA. Use in conjunction with the code reader built as described by Arthur Dalton. M16/4r2) or actuator motor (M16/4m1)or magnetic clutch (M16/4k1). Here's the same schematic, easier to read. I used an empty film canister to hold everything together. Drill holes in the bottom of the can for the LED and switch. And drill a hole in the lid for the wire leads. To read codes, plug black lead into Pin 1 (ground), plug red lead into Pin 16 (12v), plug test lead into Pin 8 or 14. Turn ignition on, press switch 2-4 secs, and count the number of flashes. After reading that code, press 2-4 seconds to read the next code, and continue iterating until all codes are read. You'll know all codes are read when you read the first code again. One flash means there are no codes to read. To clear the codes, you must first read the code, then within 10 secs, press the button 6-8 secs. Last edited by Kestas; 11-01-2006 at 10:11 AM. Is this for a W124 E320, a W210 E320, or a W211 E320? This is for the 95 (and 94?) W124 E320 (M104). The others should all be OBD2 compliant (post-95), and thus only readable with a scanner. Is this also valid for a W124, 260E European car, 1988, with M103 engine ? Here's some additional info that should accompany this thread and code reading info. It's a 169 page pdf document that covers the codes for Mercedes models from 1988 to 1998. I guess I'm hoping this thread will evolve into a sticky or DIY link. Edit: Go to the second post of the link below for the pdf attachment. hi i built that code reader to spec as was noted. when i hook it up it the led turns on for a second then burns out, i tried it twice. You must have the wrong LED - one without the built-in resistor. Frequently you will find misfiled/mislabeled parts at Radio Shack. 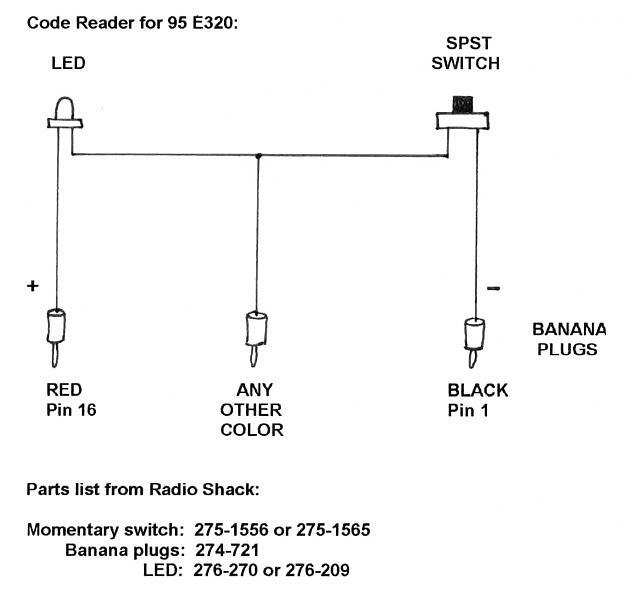 Both LEDs listed to be used in my diagram are 12v leds. I specifically put the RS part# in there for the purpose of not having someone with a few regular leds at home to just go get a sw and leads. The 276-270 is an encased version and the -209 requires mounting. Also , be aware that leds are polarity sensitive. So, pay particular attention to the pos. + sign at the LED in the diagram..
Last edited by Arthur Dalton; 05-13-2007 at 05:48 PM. Are the code numbers for a 1994 E320 wagon the same as posted earlier under E320 16 PIN DTC Charts inc. pin 8, pin 14 posting. Thanks again to all who know. What a forum, thanks to all of you.